Silver How sits at the eastern end of the long ridge of undulating high ground that runs along the northern side of Great Langdale, eventually leading to Sergeant Man. The lower slopes of the fell are very attractive, especially where it borders on Grasmere - the fell looms above the western shores of that lake. Like most of the intermediate summits on this ridge the exact boundaries of Silver How are up for debate. To the west the boundary is clear - Wray Gill runs north from Brigstone Moss then east into Grasmere, and is matched by Megs Gill, which runs south into Great Langdale Beck. These becks form the western edge of a triangular plateau, with the summit at the eastern corner overlooking Grasmere. The south-eastern boundary is the main area of uncertainty. 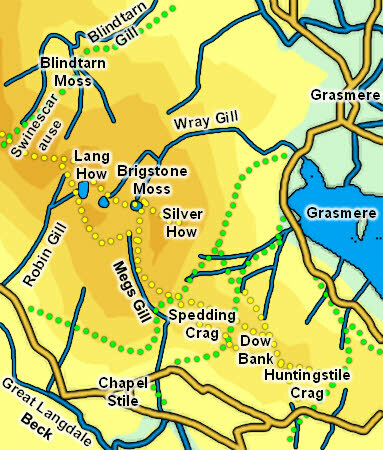 A ridge runs south-east from the southern corner of the plateau, crossing Spedding Crag, Dow Bank and Huntingstile Crag before ending at the Red Bank road from Elterwater to Grasmere. This entire area is very well served by paths, so there are countless ways to begin the ascent of Silver How. However the craggy lower reaches of the fell mean that there are fewer ways onto the summit plateau. Coming from Grasmere there are two options - one path leaves the Red Bank road just outside the village, and cuts along the base of the eastern crags. Just south of the summit there is a steep path that runs north-west up the fell, or continue south-west to the ridge path - turn right onto this path, pass the crags, then turn right again to follow a path that runs up to the summit. The second route starts on the track to Allan Bank - just before the house turn right and follow the track as it curves around the back of the property and between walls up to the edge of the open fell. A path runs across the Wray Gill, and from there goes above the crags to reach the summit from the north. From Elterwater the best approach runs along the ridge from Huntingstile Crag. There are several ways onto this ridge - along the right of way from the Red Bank road to Redbank Wood, up a second path that heads towards Dow Bank or up the right of way that climbs up to the ridge between Spedding Crag and Dow Bank. Once on the ridge turn left and follow the path to Megs Gill, then turn right onto the paths that cross the plateau to the summit. Finally the summit can be reached along the ridge path - this passes just to the south of Lang How, passes a series of small tarns and then runs along the northern edge of the summit plateau. Wray Gill rises in Brigstone Moss, north-west of the summit, and flows around the north of the fell, flowing into Grasmere. Megs Gill rises west of the fell and runs south into Great Langdale Beck. Where ever you choose to form the eastern boundary it will be formed by one of the nameless becks that run north into Grasmere or south into Great Langdale Beck. Silver How has no named tarns, but there are a number of unnamed pools on the fell.